“Ohhhh Nooooo!!! he thought. Here comes that difficult passage. Daniel was in the middle of his concert. “I know I can play it at home. But it has never gone well in public. “So far so good, but I am afraid my technique will collapse with all that technique that’s necessary for the rapid scales. What will I do if this happens now on stage?” These thoughts came into Daniel’s mind involuntarily………The scary passage was only a few measures away ……..
One helpful tactic for coping with memory slips (and the fear and anticipation of them) is to develop “jam plans”. These can be effective strategies performers can use to recover from accidents and lower anxiety about having them in the first place. It is helpful for performers to feel they have alternative pathways to regain control of the score and their feelings, even if memory fails and/or technique becomes unreliable on stage. “Jam Plans” provide a mental “insurance policy” that allows the performer to keep going and to recover. It goes without saying (but never can be emphasized enough) that careful preparation is essential. But we all know that anxiety can override the best-prepared performance. Mental preparation is as crucial as musical preparation. Here are some “Jam Plans” that may be help for you to add to your mental toolbox. You are welcome and encouraged to add others as you think about this topic when you are not performing. •	Place the music on the piano stand when performing (even if you do not look at it). •	Use the music when necessary. can use to recover and continue playing. •	Do not assume the worst will happen or give up if you stumble. •	Improvise in private and at music at lessons. Recovery is an important skill. trial rehearsal even though you would normally stop to fix mistakes. In case you are wondering about what happened to Daniel……he did not mess up the dreaded passage. However, he spent so much energy and concentration while performing worrying about it that he had a memory slip shortly after in a place that had never bothered him before. The moral of this story: Be as prepared as possible and keep your mind on what you are doing in the moment. 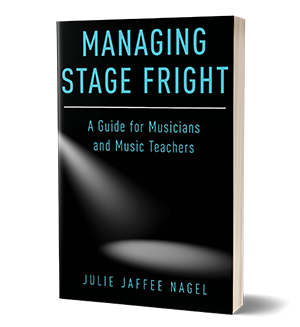 Being prepared means also being mentally prepared, to realize there are no perfect performances, and that you have a “Jam Plan” in your musical and mental toolbox.